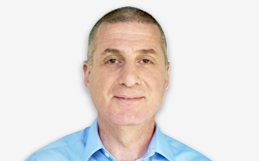 Rami Amit, our Chief Technology Officer and Head of Product joined RADCOM in February 2016. Prior to joining RADCOM, Rami was Director of Engineering at Cisco NFV BU, where he was responsible for Cisco's broadband solutions that are deployed by many top-tier CSPs. During his tenure at Cisco, Rami led several new products from inception up to worldwide deployment. He was also instrumental in the Company’s transition to virtualization and application delivery in the Broadband market. Before Cisco, Rami held several CTO positions; he was the CTO for Jungo, a leading software provider for broadband service providers, founded Surf & Call solutions, which was later acquired by CosmoCom and was the first employee of the VOIP industry pioneer, VocalTec, in which he is considered as one of the early inventors of VOIP and led many of the VOIP technologies and products, innovating with the industry’s first VoIP gateway and many other technological achievements. Rami holds an Electrical Engineering Degree from Tel Aviv University.